Why would an Englishman vote for Scottish independence? Why would a whole group of English people vote Yes? It’s a question I’ve been asked many times, and which the group I helped to co-found last week, “English Scots for Yes”, intends to answer. For myself, I grew up in Suffolk, near Cambridge where I was born. Whilst I grew up in the poorer part of a quiet working-class town, heavily rebuilt in the 60s as London overspill, we didn’t want for food or clothing. We may not have had designer labels or eaten out very often but opportunities were there, and jobs were available. When I was 18, I made the life-changing decision to move to Scotland, to be with the love of my life. I also fell in love with this land. I soon grew angry as I saw some differences between my new home and my old one. Those opportunities I had grown up with simply didn’t seem to be available. Unlike my old home in the bosom of East Anglia, London didn’t seem to know the plight of my town on the Clyde, its social wounds caused by years of industrial decline and governmental neglect. Or they just didn’t care. I began to question why, and as the years went by and I became politically active I soon realised that only independence would free Scotland from that uncaring, unknowing Westminster. Skip forward a few years, and I’m now a councillor for my wee town on the Clyde. The area I represent has some of the worst levels of social deprivation in Scotland – some of the worst alcohol statistics in the UK. Around one in four children are brought up in poverty. Almost everyone in Scotland will know areas like this. It is unacceptable. Before I was elected – as a student with a disabled partner, and later struggling to start a business – we’ve had to rely on benefits, and know the fear of wondering if we will have enough money to afford to eat this week. Thankfully we managed and things got better for us, but for many, it has not. Our town now has a food bank, something many of us hadn’t heard of until fairly recently. 21st century Scotland, one of the richest nations on Earth, and inequality is so massive that, helped along by a government we did not elect set on “reforming” welfare, there are parents that go without so that their children don’t go to bed hungry. The contrast with things that are under the control of the Scottish Government couldn’t be clearer, be it free prescriptions (so the poor don’t have to choose between medicine and food), free tuition (so education is based on ability not wealth) or freezing the Council Tax in the middle of the biggest recession since the 1920s. But it’s constantly held back and stopped from doing more by a government we didn’t elect. This takes us back to my question though – why would an Englishman vote for independence? The answer is contained in the question. I’m an Englishman. But I’m also a Scot, and I care very much for my adopted home. I’ll vote Yes because when a child grows up in Scotland in poverty, it is not just that child that suffers; I suffer. We all suffer. I’ll vote Yes because when a family is torn apart by alcohol, problem gambling, or substance abuse, it’s not just their friends and neighbours that suffer. I’ll vote Yes because when a community is devastated by unemployment and poverty, when a generation is written off due to a lack of jobs and investment, it’s not just that town that suffers. We all suffer, because we are all Scots. I may have been born in England, but I care just as much for my home, and it’s only through taking control of our own affairs with the powers of independence that we’ll be able to address the problems that confront us. 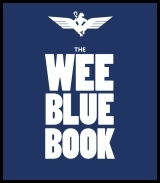 Like you, I’ve read the recent attempts by the gutter press to drag ethnic background into the independence debate – the pictures in “serious” newspapers of Mel Gibson with the Cross of St. George on his face and the inference of ethnic warfare if there was a close No vote – and that’s what spurred us to found “English Scots for YES”. Over the next few weeks and months left in this campaign, we intend to go all over Scotland, attend as many meetings as we can and talk to as many English Scots as possible and let them know that this is NOT what the independence debate is about. Because as I said earlier, we are ALL Scots. We all care about our families and our friends, our neighbours and our communities, our tons and our cities. We all care for Scotland. Because by birth, or by choice, this is our home. And we’ll let them know that we are not alone – that there are an increasing number of their fellow countrymen who like them were born and raised in England, but chose to live here, and that recognise that the best people to lead Scotland, make the decisions that need made, right the wrongs of unelected governments past, and represent us to the world, are the people that live and work here. No matter where they were born or raised, or what their accent sounds like; they are Scots. We are all Scots. And we’re voting Yes. Well said sir. I salute you. Proud to have you on board. I hope you can get your message out there loud and clea. All welcome in an Independent Scotland as far as I’m concerned. Excellent piece. The Yes movement embraces all Scots from all backgrounds and political view points. Can we keep this one and give Westminster 1000 ProudScotButs in his place? Well said. My father’s English by birth – though he’s lived in St. Andrews since the age of 18 and he’s 71 now – and he recently told me he was voting Yes. Glad to have you and any others of your kin. I am just about to explode with anger at what has been done to Scotland’s people by successive Westminster governments. I hope I make it to September 19th in one piece. Oh man, do I love this. Welcome on board Brother !! Math, we’re lucky positive people like you choose to make Scotland your home and become Scots. I wish you and everyone working for an Independent Scotland all success in the coming weeks and months. Here’s to a new Scotland full of old friends. And as I’ve mentioned before every single English person I know that lives here is voting Yes. They seem far more aware of the inequalities that Westminster thrives on than many people born and bred here. It matters not to me if someone was born here or not – if they live here and consider themselves Scots that is enough for me. Indeed, it doesn’t matter if they don’t identify as Scots – if someone lives here they are all part of our society and should be welcomed. I want to cry reading this. As an adopted Scot (from France), I also feel the way you do. I think that people from outside Scotland have often come from countries where we had our own government, and sometimes we can find it a no-brainer; of course Scotland should be independent. I can perfectly understand why someone from England would be pro-independence, I struggle a bit more with Scottish people who want another country to continue ruling over them. Excellent article. Why should an English Scot be any different to a Polish or Italian Scot if they all live in Scotland. We should all want whats best for our nation. The fight here is not the phoney England v’s Scotland portrayed in the media. It’s the Scottish nation v’s the British establishment. The Scottish nation being the people who live and work here. Not some millionaire popstar living in New York telling Scots to stay with us. That is about as crass and cringeworthy as no get! My aunt and uncle retired to Scotland 4 years ago. My uncle was born in Bethnal Green, bombed out during the blitz, later joined the RN. He is now in his 80’s and has visited Scotland all his life and he says our country has went down hill over the years. (he remembers the shipyards and bustling Clyde). I am glad to say he is a firm YES, and spends his time trying to convince his Scottish NO voting neighbours! The referendum outcome will be down to the half a million English people who have settled in Scotland OF the ones I have spoken to there are only around one in five voting yes. Should have mentioned, I’ve a few english friends, I think a couple are actually yes men, but they just don’t have the confidence to declare as they are patriotic english men…..I think if the english had an identity rather than being seen as ‘British’ then we wouldn’t have this issue. Hopefully this group gets a load of coverage, I’ll be sharing this article on FB and I hope everyone else does. It’s very important and can also help win over the ‘Scots Brits’ who seem to think because we share the same island we should be ruled by the same government. I was also born in England and want Independence for Scotland with every fibre of my being. I’m old and the referendum won’t affect me much, however it goes, but I will be totally gutted if we don’t get independence. I want so much to be able to say that I lived long enough to see it happen. Wonderful stuff and another boost for the YES team. Great article. Remember this quote. RB Cunninghame Graham- founder of the Scottish National Party. As the saying goes – it’s not where you’re from, it’s where you’re at. Welcome to the cause Math. You are not alone, we have some English people in our local YES South Annandale group and they are every bit as welcome as anyone else, just as it should be! In fact we had a meeting in Annan Academy last night for undecideds and one of the speakers was Mark Frankland who describes himself as a “Lancastrian” for independence. He gave a very good speech. Here he is giving a speech in Lockerbie back in March this year. Was feeling a little low today[bad chest cold]but on reading this my spirits have been given a boost…who needs antibiotics! The influence of English people who are committed to an independent Scotland is going to be important. If there is one thing I have always believed the English do better than the Scots it is getting involved. They seem more willing to actively participate in their communities; and many a local organisation in Scotland would fail but for the drive and enthusiasm of its English members. Civic apathy is possibly the Scots’ biggest shortcoming as a nation: and that’s maybe why the referendum campaign hasn’t exactly set the heather on fire yet. If the English people among us can help an independent Scotland to change in this respect, so much the better. Wish you and your group well, Math. You have a job to do with some of your compatriots (cf boorish clown I work with mentioned on here before) but not with others (English mate who I’ll be sharing a pint or three with tonight, and who will vote Yes). And of course, we still have work to do to convince the Scots-born TWTPTS brigade that self-government is not an abhorrent state of affairs. But I hope the question of which way native Scots and English-born Scots have voted is rendered moot on September 19th after a resounding Yes. I’m Yorkshire born and bred. Perhaps we need ‘Tykes for Indy’. I’m glad that the attempt to divide us English both Scots from our friends and neighbours is being challenged. For what it’s worth, I know at least five ‘Yes’ voters born below the Tweed. Brilliant, my wife is English and she’s a YES vote, she can’t believe how lucky we are to have this chance to change our country for the better, to shape a new future for everyone. Fair brings a tear to my eye. Hmm, we moved up here when I was 8 and I was stuck with an English accent by then. That didn’t do me any favours at school..
Can’t respond to you all (too many of you!) but thank you all..
RichardLucas: yeah, I was kinda worried…my Dad was a yorkshire man, and our logo, which I helped design, is an english (tudor) rose…because we stripped it down to one colour tho, and the middle has a YES in it, it looks almost Lancastrian…. Bah gum lad, be many a yorkshire man ‘ll not be right chuffed wi that! But have you not suffered from that anti Englishness from Scots about which we read and hear in the MSM?? Were you not bullied in school/college because you were English – like Ronni Ancona in douce Troon?? couldn’t abide either, no matter from whence they hailed! Great to hear that you have started this as yet another of the many arms of YES! This article has more clout than anything I’ve ever read or heard from the Westminster-backed propaganda machine. Maybe, one day, writers looking back on a successful campaign for Scottish independence will refer to the importance of the English-Scots-for-Yes factor. More power to your elbow, brother. I’ve always seen that as Scotland’s best attribute. We’re open-minded enough to put aside petty concerns about which bit of rock someone was born on and accept anyone who wants to make their home here or just come over for a visit. I confess, I hate one English person. But it’s my ex-wife, and her being English is not one of the myriad reasons I hate her. Now that’s been established, in one important regard I see English born folk in Scotland in exactly the same light as anyone else. If you are here to add something to Scotland by your presence and make a home for yourselves, as the author of this piece clearly did, then in my book you are welcome in Scotland, and if you wish to refer to yourself as English Scots that’s clearly not a problem for anyone with a brain either. You are no different to Pakistani Scots, Polish Scots, French Scots, and every other nationality now to be found living in Scotland. On one level you will always associate with where you came from, but that is no longer completely who you are. I salute the emotion and the romantic notions of gaining ‘freedom’ from the tyrannies of the English Establishment. I also honour the depth of feeling in the many comments of support. But where’s the freedom in being tied to the Bank of England (as Alex wants)? Where’s the freedom in being isolated – out of Europe, regardless of what Alex says? Where’s the freedom in having to borrow money at higher costs? Of course, no glimpse of reality is going to change the minds of those who cherish the idea of a new Brigadoon. The latest polls show an increasing likelihood that the ‘Nos’ will prevail so we may never know what might have been. @Dorothy Devine – I’ve always thought that if a bit of teasing in school is the worst of anti-Englishness in Scotland then they’ve got it good. At my school, we picked on one boy for being from Shetland, another for being English, another for being from the east coast. I’m far from proud of any of it, but kids will pick on other kids for all sorts of reasons and within weeks, will more than likely be playing with each other like nothing ever happened. I think as adults, most people fit into Scottish life pretty easily. There will always be a streak of nastiness in every society towards “outsiders” but it’s certainly no worse in Scotland than I’ve encountered anywhere else and might well be a lot better. Whatever the reasons for that, it’s something we can be proud of and build on in future. I should, however, point out that I have heard the word ‘English’ with additional crudity attached. It was many years ago now, up north in the ‘far north west’ the BBC weather reports refer to. You do get idiots. Some people think nationality is very important and have this vague thought that we spent hundreds of years fighting England so you’re our enemy now. Rubbish, of course, but some people do seem to think like that. And for final balance, I should add that the English man in question was an example of the kind of arrogant plook that wouldn’t go down well anywhere, and is unfortunately found everywhere. Nationality is not really an issue; you get them from every nation under the sun. His Englishness was merely the channel some of the more vociferous of my youthful contemporaries chose to shout about. Not me; I was too busy trying to attract the attention of his frankly stunning eldest daughter. Failed miserably, as it happens. Being a young teenager at the time I was crushed for, oh, all of a couple of days. They did end up moving away. And as if to add a humourous counterpoint to it the next guy to buy their house was head teacher at one of the nearby (for the Highlands, I mean) secondary schools. Born and raised Scot… no one liked him either, and he didn’t have a stunning daughter to add a redeeming feature to his presence. PS…. 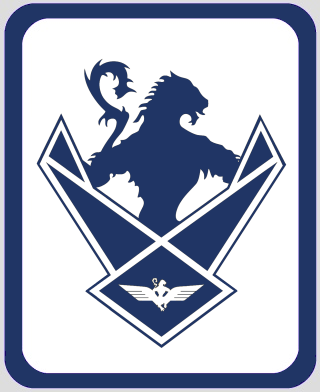 like the English Scots logo. Nice work. This is a very important development given the attempts by the press to preemptively blame voters born in England for a No outcome. 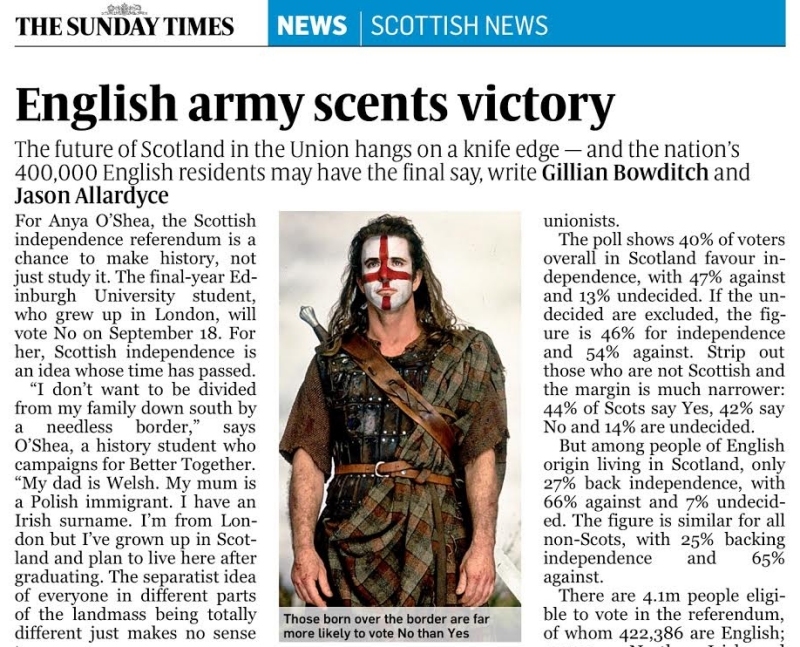 Great article and congrats on the new group English Scots for Yes. Now, time to battle the MSM to get your group maximum press coverage! We do need to accept the reality that English people in Scotland do probably hold the balance of power in the referendum but it’s just a fact of life. I know a lot of English people here in Aberdeen and all of them are voting no. They all have three things in common. They make a good living up here and everyone likes that. The UK gives them complete right to consider Scotland their country and Scottish independence will diminish their country, England. There is no paradox involved and I don’t argue with any of them, unless they moan about Scotland. Why will they give up something they already have? We’re all Scotland’s story and we’re all worth the same. I’m English. I chose to move here 11 years ago; yes, I like the scenery fine well, but I also liked the differences too. We have our own laws; our own health service; water that wasn’t privatised;our own education system and a different approach to public services and the less advantaged in society. The monarch isnae Queen of Scotland – she’s Queen of *Scots* a people meant to be sovereign in their own land. Scots have traveled the world over in search of work and to pursue a future; why should we now doubt our ability to make our country thrive again, just when we’re gifted the chance to make our own future? I will – indeed – take Scottish nationality, but I’ll always be English, British and have connections with the rest of these islands. But why should that stop me from wanting to live in my own independent Scotland? This is what you are agreeing to if you vote no. It is as simple as that. Makes me want to cry. Great article! That’s now on my Facebook page! My Mum was English and I have loads of English relatives. They just wish me well and hope that people in the RUK can benefit too after Independence! As has been said many times it is not about looking backwards (although we should know our nations history). It is about the Nation we all want to build. I don’t want to simply be a mini-me GB – in fact it is the last thing I want. We come together with a desire to build something much, much better. That is the reason the YES campaign is so united. We can see a fairer Scotland and I know that everyone here knows what I mean by that simple statement- that’s what makes it exciting. I fully expect many in the rUK who share the societal vision of an Independent to move here and I welcome those who will do. A great article Math backed up with some terrific comment. We’re tied to all that stuff now. But we’ll have a vast amount of other economic and political freedom that we don’t have now, plus of course the freedom to choose a different currency path further down the line if and when it suits us. The point is, the decision will be in our own hands. Welcome to YES,it’s good to have you onboard. OT. A friend received a letter from SNP this morning asking him to sell raffle tickets. 1st prize – a car. 2nd Prize – £2000. 3rd Prize – £1000. Specifying that they need money to fight back against BT who will be spending loads over the next few months. Asking for ticket stubs and payment to be returned no later than 12th Sept. Does that seem to be leaving it a bit late? Can’t find mention of it on SNP site. There was also much talk regarding raffles earlier in the campaign. My friend is a user of the MPS and was a bit confused as to how his name ended up on a mailing list since he hasn’t committed to either side yet (I’m working on him). Has anyone else seen this? I’m English, brought up and educated until my mid-20’s in the stockbroker belt. My first job out of college was in Dundee, and I’ve lived in Scotland for the last 20 years. I wouldn’t go back, and I’ll be voting Yes – really don’t see way anyone wouldn’t. Care to outline the EU’s expulsion procedures, Ian? Civic apathy is possibly the Scots’ biggest shortcoming as a nation: and that’s maybe why the referendum hasn’t exactly set the heather on fire yet. Some excellent comments here to a refreshingly positive post about being English and supporting Independence. We’re A’ Jock Tamson’s bairns after all, and after a YES vote we will all have to get busy building the kind of Scotland we want. The logo looks great. Opinion polls that the Newspaper referred to may well be more to do with the age of those being polled than country of birth. Over 65s at the moment are less likely to vote Yes wherever they are from. Higher percentage of English born in Scotland are retired. So those headlines are not borne out by the facts. Brilliant, just brilliant! A breath of fresh air! Something weird is happening with these disappearing posts. I have tried to post comments twice today without success. The only other time this has happened was a few weeks ago, when I tried to post a comment on the same subject. I wonder if there is a particular word or phrase that is causing comments to be zapped. Fabulous, Math. Of course, we all know that BBC Scotland and Scotland 2014 will lead with articles about a new,positive, grassroots campaign……..Yeah, dream on! OT. A friend received a letter from SNP this morning asking him to sell raffle tickets. One of the callers on Thursday’s BBC Radio Scotland ‘Morning Call’ yesterday (Thursday 29th May) mentioned getting sent raffle tickets to sell, from what sounded like the SNP. The Corries used to ask at the start of their shows Are there any English in the audience tonight ? When the yes shouts puts went up they would say” your welcome in spite of everything” to much laughter. Well I had been having trouble convincing one of my neighbours to turn yes until about half an hour ago when I showed him this section suddenly the penny finally dropped that not everyone who is voting yes is an S.N.P.member or a bigot or someone who hates the English, or wears a kilt, or lives in a wee but and ben. After reading all above he now sees that we come from all corners of society representing all sorts of people but all are wanting a future that is better than either our past or the present. So thank you all who posted you turned one very determined no supporter to change to a yes. Well done ! Great article, I was in tears. I too was born in England, though my father was there originally due to doing his National service and he stayed until after we were all born and been through early schooling before coming back. We want undecides to come and hear the arguments and so we would be very happy to see you guys as you sojourn around the country. I know of at least half-a-dozen English people residing in Scotland who are YES, and since they’ve been in Scotland they have also supported the SNP. Return, leave from George Square at 22:30. I will meet the bus at the first pick up point in Brechin. I like the logo! I would wear a little pin badge with that on! @ Iain Hamilton, I received raffle tickets yesterday, but Im involved with Airdrie & Shotts Yes campainers = local SNP councillors may have put my name forward olso my MSP Alex Neil. With this most the articles i read about Independence are Pro-Union. Even though you would be surprised (as i was) from the “comments” sections of these Newspapers at the ever growing amount of English people who state they currently live in Scotland and will be voting Yes. It seems to me the more they print the more they see the lies that are being said, the English are no more stupid than we are. Well most of them anyway. Shouldn’t we have the freedom to make that decision as soon as we’ve voted yes, rather than at some vague unknown point in the future? Surely crucial decisions such as whether we want Scotland to form a currency union with rUK or not should be in our own hands right from day one? I am an English Scot who moved to Edinburgh in 1990,and felt very welcome I might add! I married a Fifer and we are both YES canvassers,I cant say all my English friends are for Independence but most are voting YES.My Dad,who has lived here for 4 years,announced this week he is voting YES.I was stunned but happy,he has voted Tory until quite recently,and its all because he is unhappy with this unfair society. Good luck with getting the message out,it has nothing to do with our birth place,just our passion for change! English will vote yes. It’s only the Brit-Scotch that would vote no. O/T I’m hearing in the ‘news’ that B&Q are Scaremongering, saying that the DIY chain would halt investment in iScotland due to percieved uncertainties after independence. It just so happens that Sir Ian Cheshire, who heads the Kingfisher group which in turn owns B&Q & Screwfix, is an adviser to a certain David Cameron and was knighted by him last year. Don’t you just love coincidences?! Thanks for the article, Math. This is about who lives in Scotland, not where they were born. I saw a photo of the B&Q boss at the opening of the Pt Glasgow store, in the company of Jo La and some other Labour drone. I think the referendum has been coming for 2 years and they are still opening stores duh! I guess JoLa needs some ammo for next weeks FMQ’s and some scarey headlines for the D.R. and Tarquin Cretin. To be fair, he doesn’t say he would halt investment permanently, just put it into ‘hibernation’ after a yes until he knows the currency, EU, tax situation of an independent Scotland. He also says there is “no way” B&Q would leave Scotland after a yes vote. Very good and touching article Math, I’m optimistic that many people who move to Scotland from elsewhere in the UK, will vote yes, because they don’t like what they see coming out of Westminster,thanks for sharing your thoughts, with us. There are word filters, but they only put stuff into the moderation queue, not the spam filter. Fact of the matter is that when a site’s getting half a million spams a month (as we are), there will always be a tiny proportion of false positives. It’s just one of those things, unfortunately. Best thing is to contact me via the Contact page, not in comments, because I just don’t have time to read every comment any more and there’s a good chance I’ll miss it. Re SNP raffle tickets, I’ve received them. I’m not a member (indeed of any party) but did sign the Yes declaration. Yer a man with the prioritys of common decency, fairness, and equality, to have someone like yersel claim and want to be Scottish is a privledge and honour to Scotland. To be Scottish is more than the right of birth, to be able to see your fellow man & woman as a person equal as yourself and entitled to have an equal chance at life’s challenges, regardless of their origin, is as much scottish as your place of birth. This seems an appropriate thread to ‘come out’. I am English, by birth, but have spent the last more than 36 of my 39 years in Scotland, brought up by Scottish parents. I have always known I’m Scottish but English too (on a technicality, if you like!). I am really angered by the No campaign’s division tactics, and lies that cooperation can only happen through complete subservience to a larger neighbour. This isn’t being neighbours. It’s living in each other’s pockets and it breeds resentment. I don’t regard England as ‘foreign’ and never will, but neither do I regard Ireland, or France, for that matter, as foreign. But I still want us all to be independent. Cooperation is, by definition, action towards the mutual benefit of two or more parties. If you are one party, then there is no agreement, no cooperation. There is a dictat. This is why I believe that relations in these islands will dramatically improve after independence, both on a personal level and a national level. Gone will be all the arguments over who subsidises who, or who governs who, or who dominates who. It is great to see this new group. I can perhaps direct my two English colleagues towards it. One is a full-blown Yes carrier, who delivers Yes newspapers. The other, I’m not sure about as we have just recently started talking about it, but the noises he makes suggests he is in favour, and no fan of London. He is interested in going to events, so we’ll see. I also have friends with ‘foreign’ girlfriends/wives, who I know are also voting Yes. The bringing of ethnicity and nationality into this debate is one of the more unforgivable things the No campaign have done. We can fight it by celebrating the diversity of the Yes movement. However, I fear that most people are not aware of these different groups, and only know about Yes and ‘Better Together’ [sic]. How can we get the message out that there are large numbers of different groups all supporting Yes? Does anyone have a list? Or will this become clear in the regulated period? Spoken like the member of the nation I want to be part of. I’ve heard many an English person talking to Louise White or Kaye Adams in the morning phone-ins, saying they are going to vote Yes. More power tae ye. BBC / News papers report that 1 in 3 British Citizens have racist leanings. BT ramp up the use of the word Foreigner in subsequent press releases/online comments/interviews. Enough said – There are very loud echos of stirring up racism here. My belief has always been, your nationality is whatever it says on your passport(s) but your identity is whatever you say it is. If you think of yourself as a Scot then a Scot you are. And welcome. In fact, as I wrote to another Englishman on Twitter today, Céad míle fáilte. 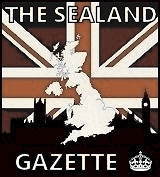 @Triangular Ears – Totally agree, why should it be if our wee country wants to exercise self determination we will be ostracised and outcast by our ‘partners’. This should not be the case I agree that we could get along better after indy. I know that many English people take it as a personal slight that Scotland wants to govern itself but I think they would soon see that we are not turning our backs on anyone. TBH, if you polled random 1000 people anywhere in the world, you’d probably come up with a fair proportion having “racist leanings” (however those are defined). It’s human nature, fear of, and thus possible hostility towards “others”. It’s the job of the government, the education system, the press to fight this tendency. On this count the UK gov/establisment and MSM are failing. Worse than just failing, they seem to be stoking the fire of “racial” division or xenophobia. Despicable. I’m glad people are fighting back, such as Math, and other “X nationals for YES” groups. Excellent article, thanks for taking the time to contribute. Keep up the good work, I will look forward to reading more about this group in the future. My Boss is from London and moved up here around 8 years ago, mostly to get away from London and make a better life for his kids. He is well into his outdoor activities ect and helps to run a few local groups in that area. He plays a bigger part in the community where he lives than most of the locals do! As the debate has progressed, we have always chatted openly at work about it. It wasnt long before he declared he will be voting YES. I think he was decided before most of us at work actually. For him its to do with being in a normal democracy, A hope for a fairer, more equal society and the hope that if/when we achieve it, it will eventualy rub off onto the good people living in RUK. He detests the way his country of birth is governed aswell and regularly has a good rant about the house of lords and maggie thatcher too which is always entertaining. OT – He almost got in trouble from management when we refused an order to put the Union flag up when maggie died. Actually most of my work across the country got in trouble in some way for trying to prevent the flag going up! Eventualy we gave in and decided to do it together. We put the flag up alright, just as we were ordered to, but left it about a third of the way up the pole at head height, looking like a damp squib, half a job well done. didnt get into trouble of course as we put the flag up as ordered. Of course, no glimpse of reality is going to change the minds of those who cherish the idea of a new Brigadoon. The latest polls show an increasing likelihood that the ‘Nos’ will prevail so we may never know what might have been. Hmmm – I would not put too much reliance on the polls. As seen in the past, Polls don’t always get it right in Scotland. No poll really predicted the 2011 landslide…and the biased slant evident in some together with some loose interpretation makes them appear even more suspect as detailed on this site at regular intervals. Also, I also find that folk originating from England are more likely to vote Yes when I speak to them. Further to that, tourists here in Nairn visiting from England are sympathetic and a couple told me they would move north of the border if Scotland voted Yes. Another bit of feedback I hear on the streets from English visitors is how positive, energetic and enthusiastic they have seen the Yes campaigners to be – the energy is something they never see sough of the border in any political campaign. Almost without exception, any English visitors I have spoken to has wished the campaign well. Well said that man I salute you and the many others like you. You and anyone who wants to work hard to make OUR Scotland a great country are more than welcome to live and thrive here. Great article both knowledge and passion, thank goodness your in the yes camp. It still amazes me how many great spokes people we have on the side of righteousness. I know plenty of English people voting Yes. The real Hearts of Oak. Thank you for your responses re: SNP raffle. Been out to work since original comment. Just checked and it is indeed now listed on their website. It all just seemed a bit weird. With all the nonsense at the moment I’m quite pleased i haven’t got around to supergluing my tinfoil hat to my head permanently. Prize for the most lost character in the world right now must be for Ian Alexander. A man who does not realise he is in amongst some highly motivated, well informed people who have no pretensions about Brigadoon (does he know that’s fictional, do we think?) or Braveheart (loosely based on fact but not much better than fiction) must surely be lost. We know about as much about the EU as common sense and investigation can garner. Out seems deeply unlikely. 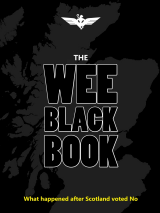 Five million plus Scottish residents, biggest oil reserves in Europe, biggest fishing area in Europe. Oh aye, they’ll want us out, eh? Never mind the limbo it would dump EU residents in Scotland into, and Scots living elsewhere in the EU for that matter. Oh aye, the EU, they’ll really want us out. No one has the definitive legal answer on Scottish membership of the EU though; because that’s for the legal minds at the European Commission and they will not issue legal advice to anyone except the government of a full member state. For some reason the UK Government seems wholly reticent to ask. Can’t think why. Oh, and Jose Manuel Barrosso’s comments are the opinions of one man, who is a career politician and not an expert on EU law irrespective of the fact that he’s President of the Commission. Borrow at higher costs? Standard and Poors don’t seem to agree; their pronouncement was along the lines of ‘even without the oil resources we would still be minded to give an independent Scotland our highest rating.’ So that’s higher than the UK currently gets, then. So that’s lower interest rates, then, on international borrowing which funnily enough we might actually not need to use anyway. It’s the oil stuff, you know, it’s worth quite a lot and the oil industry, not the UK Government, thinks it’s worth pumping billions of pounds of investment into. Would they do that if it was only going to last for another couple of years? Hardly. They’re in it for the money; they do not invest if they don’t believe they’ll get it back plus interest. As for the polls; I will give you one piece and one piece only of advice. Don’t believe any of them. If viewing this site and others has taught me anything it is that polls can be manipulated by so many different things the original data is no longer anywhere like the result. They are all unmitigated shite. And if you don’t believe me, I suggest you Google the Prime Minister of Quebec for his opinion on polls. Let’s just say, considering he was all for a No vote in their referendum, he’s a lot less than happy with polls. They all predicted a comfortable no vote; the end result was a win by less than one percent. Where else have we seen polls consistently returning a comfortable margin for a no vote, I wonder. In short, the No campaign has little to be confident about. On the last day before the campaign proper I was struck with two programs on Radio Scotland and found it very easy to draw connections between them. Program 1 was the morning call-in which was about the racism survey. I can only comment on the short piece I heard on the way to work but essentially a few immigrants, 1 from Brazil and the other from Africa (can’t remember which country, sorry) who both asserted that they had never been the target of racist abuse in Scotland. The presenter kept returning to a call received earlier from a gentleman who had been racially abused FOURTEEN YEARS AGO. Someone mentioned stirring up of racism in Scotland. I’m not just paranoid am I? I will be voting yes, I have only been living in Scotland for 4 yrs, im English. but I believe EVERY country should govern itself. No country should be ruled by another, if this was the way then there would never have been different countries, different languages and different creeds. ps. loving your YES logo. I was born on Tyneside in 1947 and moved to Kintyre in 1991 I now live in South Lanarkshire, I met Alex Salmond in 1992 and I was hugely impressed by him. I have been an SNP voter ever since. Really enjoyed your piece, keep up the good work. Onwards & upwards! Great article. I too was born in England, but came to Scotlamd when I was 18, and have now spent more than half my life in Scotland. I am married to a Scot and have two fantastic Scottish children. I have always felt accepted here. This is my home. I will be voting YES! I got thinking about English-born people in Scotland and how they might vote in the referendum. The MSM in Scotland would have us believe they’re all voting NO but the word from the grassroots and from here and other online sites shows that’s patently not true. Many England-born are voting YES. It seems to boil down to this settlers/colonists dichotomy that Alasdair Gray mooted (at Bella or somewhere, I can’t find the original article now) and got absolutely slated in the MSM for being anti-English etc. etc. But he was right. English “settlers” see Scotland as their home now and are likely to vote YES. “Colonists” of course see Scotland as only a region of their country (UK) where they’re staying for a while for career reasons or perhaps retirement with lower house prices and great scenery. It also seems to me that a lot of the English in Scotland are very enthusiastic about Scottish independence, more enthusiastic than a lot of Scots. Maybe they see it as a way to get rid of the undemocratic, corrupt, rotten Westminster system. They would’ve seen it first hand better than anybody in Scotland – especially younger Scots who were just kids in 1999 and take devolution, Holyrood, SG as granted. And by the way Math, I have relatives who were born in Scotland & moved to England. They have children who were born in England. After a yes vote , we’ll all still be a family. We’ll continue to live on the British Isles. We won’t be “foreigners” to each other. We’ll have our shared history & memories together. We’ll phone, text or email each other – just as we do now. We’ll drive, fly or get the train over the border whenever we want to visit each other – just as we do now. We’ll still all watch Corrie or Eastenders at the same time – just as we do now. And despite what Georgie O & Danny A tell us, I’ll bet we’ll both still use the pound – just as we do now. The only difference will be that my relatives in England will have a govt that the people of England elected. And here in Scotland, we will have a govt that the people of Scotland elected. Great work Math. Welcome to Scotland my friend. Welcome, friend, and all others like you ! Haven’t read all of the comments but can anyone put up there hands and say “I picked the country I was born in”, no so ethnicity has bugger all to with anything as we are all descended from one of seven African mothers. Was called a Sassenach back in the sixties and never since except in jest as my accent stuck and I can’t stand mushy peas. I find it sad that people have had to start identifying their colour, birthplace or religion to counter the rabid MSM in trying to manipulate divisions to sell their daily trash. We have one chance only of ever destroying the most corrupt political system of government so don’t let the world down and vote YES in Sept.
My wife spent the first 22 years of her life in England, and the 24 years since then in Scotland. She recently told me she now feels Scottish. She’s long since been a confirmed Yes voter, but I was still quite surprised. My mother is also English, and has now lived in Scotland for 50 years. She’s also voting Yes, as she did in 1999 and 1979. My father in law, however, lived in England for 50 years and Scotland for 20. He’s a firm No, but he can at least understand my reasons for being Yes, even if he doesn’t share them. But the two most implacable Nos I know are both Scots, and neither of them can articulate why they’re No, beyond arguments that boil down to “too poor”. I’m still working on them, but they’re tough nuts to crack. funny how we are told the economic sky will fall if we go independent, it is fairly obvious that any problems Scotland would face would be due to the English establishment creating them, obvious that they have no respect for democratic process or indeed the Scots themselves, also very telling is the total lack of positive reasons for staying in the union, all we hear are threats and doom laden predictions. £5 donation will get you one….we’re also hoping to do some metallic enamelled ones too! Matt Seattle, thank you so much for that. I could hear my old Grans Border twang again. Brought a wee tear to my eye. English born, Scottish trained. Only seven years in Scotland and now emigrated down under. Nonetheless, I owe a lifetime of gratitude to Scotland and would be nothing without it. To my mind, the matter is not even THAT complicated. I believe it’s a simple matter of liberty and equity. In this so-called civilised society, if enough Scots wish to govern themselves then who on earth is London to dictate to Scotland? I wouldn’t expect a vote even if I was still resident in Scotland, but I wish this brave new world all the very best. I fondly remember Scotland and all it did for me, and will never forget. Well Kalmar, do you still have an English accent now? Well said mate. I hope after independence that a good few thousand of these spineless Jelly Jocks flee south and leave room for incoming upright Englishmen to be part of our new future. Welcome to all English people who live here and intend to vote Yes. However, my experience has been, having lived in Argyll for twenty years is that I have encountered far more ‘colonialists’ than ‘settlers’ amongst the English domiciled here. Many of the former are ‘white flight’ refugees,openly admitting they are glad to get away from ‘the blacks’. Many of these, surprisingly, voted SNP. But on reflection, I understood that this was a convenience: free bus passes, free personal care for aged parents; frozen council tax etc. These people undoubtedly voted amongst the 140,000 ukipers at the Euro elections. They tend to be older and have bought houses at a fraction that they would have got south of the border. They do not recognise Scotland as anything other than an extension of Greater England. And why shouldn’t they? Their education, history and culture have told them that is the case. This sets them apart from just about every other migrant to this country. They are quite vocal about their objection to our self determination struggle. I cannot estimate their numbers, but they appear to outnumber greatly the settlers, those who integrate and add greatly to the small communities of ancient Dalriada. I understand that we have large numbers of Scots tories;orange and green bigots; uneducated anti alicsalmond haters etc, all of whom will be voting ‘no’. But having listened to Brian Taylor’s programme on Friday in Townhead, I counted 6 or seven English voices, all critical of Independence. This has been replicated on Question time and other programmes. The possibility that a couple of hundred thousand English votes could swing things would, for me, be a bitter pill to swallow. However, I am a democrat and would accept this, in the same way I would accept that the other 700-800,000 other NO votes were Scots. However, my real fear would be that without a ‘Yes’ vote, that we will never have such a thing as Scottish citizenship. This and this alone would ensure that all people coming to Scotland to live would eventually become as one nation. Thus, we could never have the possibility of a Ukrainian situation where parts of our country were voting for reunification with a bigger neighbour. A ‘No’ vote would, in my opinion, bring far more colonialists in than settlers, and therefore make a subsequent Referendum (if we fail this time) almost impossible to win. ‘ate the english doll, nae chance, us cocknees are up ‘ere in flocks, ‘ave been for some time and we ain’t lettin’ them nobs from dahn sarf come up ‘ere wiv their ‘igh falutin’ nonsense. Scotland for those wot live ‘ere, that’s wot we say. I’m English, born and raised in Northern England and educated in Scotland for 4 years after leaving School. Had to chose who to vote for in 1974 and only the SNP made sense. I hoped that success in Scotland would inspire people in the North to take control of their lives and economies that were and still are dictated by the needs of London and the South East. I rejoined the SNP when various English celebs started giving ‘informed’ opinions on the benefit of union. Its surprising how ignorant the average Englishman is about the whole debate and the BT misinformation campaign has had some success, but there are still a considerable number who understand and would support a Yes vote. Whats good for Scotland is also good for England. Funnily enough, well not funny really, I met an English couple at an event in Inverurie yesterday. I had met them at a similar event inn Wales a couple of years ago. They were on holiday in Scotland for the first time are were surprises and gratified at how friendly folk were towards them. What myths are the English media spreading? It is natural that the English would have feelings of rejection, and at the same time a sence of loss at the prospect of Scotland becoming a Sovereign Nation again. Rejection is one of the worsr emotions that a human being can endure, just ask a salesperson, and I am one. But these feelings can be reversed by embracing the concept that actually Scottish Sovereignty administered fairly for the betterment of all of it’s society can showcase an example to the rest of rUK, and in particular the ordinary citizens thay they are just as neglected by Westmonster as their Scottish counterparts. It is Westmonster’s rejection of fair play towards Scotland that has significantly fueled the desire for Independence in the first place. If any English people harbor any ill will towards Scotland seeking Independence from Westmonster then they are misplaced fof that ill will should be redirected to the source, their own Government Westmonster. Solidarity, Math. We’re voting Yes for a just and fair future for all not just the few who never cease to exploit this world for their own private benefit. The common weal binds us all together in a cause for which we can all be immensely proud: The elimination of poverty and injustice and love for our fellow Scots and all humanity! Scotland can lead the way again. Britain is only for the rich: Our independent Scotland will be for ALL OF US, together as one family. I don’t see the main premise in this article as being something that’s uniquely Scottish and am a bit surprised that someone should compare an area in prosperous England to one of the most socially deprived areas in the country. Following on from that I could go from living in a decent area in Edinburgh and move to Tower Hamlets in London and come to the conclusion that Scotland does better from the government than London. We all know that is stupid but it seems to be the backbone of this article. As a Londoner whose now living in Wales I have to say that the amount of poverty I see now is much less than when I was in London. As a volunteer helping people dealing with debt in London I almost despaired of the situation people found themselves in. The main problem we have to deal with is the control of capital and the greed of the markets. Very little has been done to address this since the crash and I see nothing in the SNP policies which makes me believe they want to change this. I understand your desire for self determination but it’s best to be honest and accept that you won’t be any better off. You only have to look at France at the moment to see what happens when to try to do things differently and more fairly. The wealthier amongst them just move to London. If you do vote yes I do wish you well though. From a personal point of view I hope you stay as having a Scottish mother I think it would be sad to break up our union although my Mother is slightly more pro the yes camp even though she hasn’t been back for 50 years and can only put a fake accent on nowadays. I’m English, joined the SNP in 1974 when a student in Scotland and rejoined this year to support the Yes vote. I’ve lived back in England since 1977 but you have to ask whether the case depends on the birthplace of any individual? The case for independence is either right or wrong … in my view two equal and mutually friendly nations can live side by side far more easily than a small nation being run by a larger one. Scots will no longer be able to complain about what is done TO them as it will be done BY them and hopefully much better than now. What is frustrating is that the standard of political debate in England on the referendum is so poor, and so very one sided. It seems to consist of vilifying the First Minister. In reality the task of running an independent Scotland will fall to others.